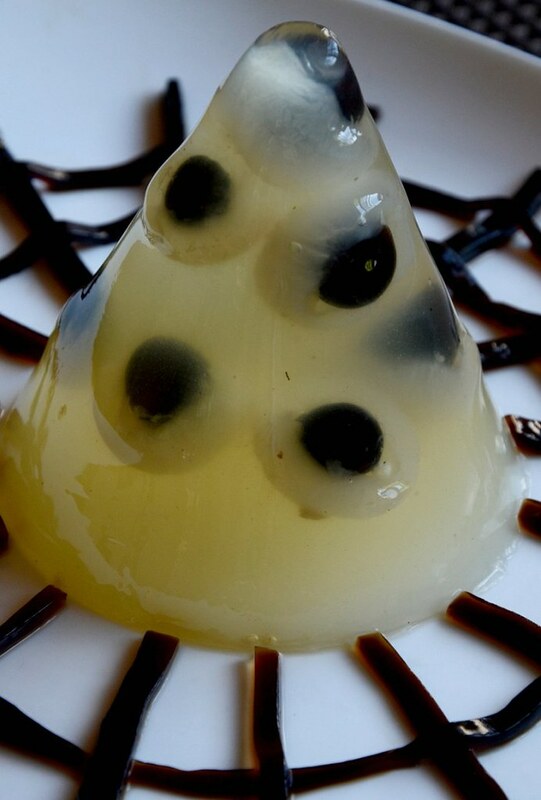 Fresh longans in pure sugarcane juice jelly, sitting on a spider web made of grass jelly. Whatever your feelings about Halloween, unless you've experienced it, don't get too paranoid about this tradition. I went through four Halloweens and not once was I spooked. In fact, I'd rather Halloween than Hungry Ghost Month, especially in Penang. I don't want to be in Penang in the 8th lunar month. Three years ago, I was in Penang during the Hungry Ghost Month and I was spooked the three days that I was there. I remember how one night when we were walking in an alley looking for a famous tofu jelly stall and we turned a corner and suddenly in front of us on the road was a stage with thin red sheets blowing mysteriously, eerily in the night wind. I held my breath as the wind blew, almost revealing what was behind the sheets. I expected to see an ancient wooden coffin or yes, a real ghost, and I could feel my skin contract. We quickly turned and ran down the street, which was fittingly empty. I'd rather go through Halloween than Hungry Ghost Month. Western ghosts are funny. Asian ones are drop dead scary. I thought maybe I'll do a wacky jelly, one with eyeballs like those Halloween jelly eyeballs. But instead of eyeballs made of jelly, I wanted 'real' eyeballs. 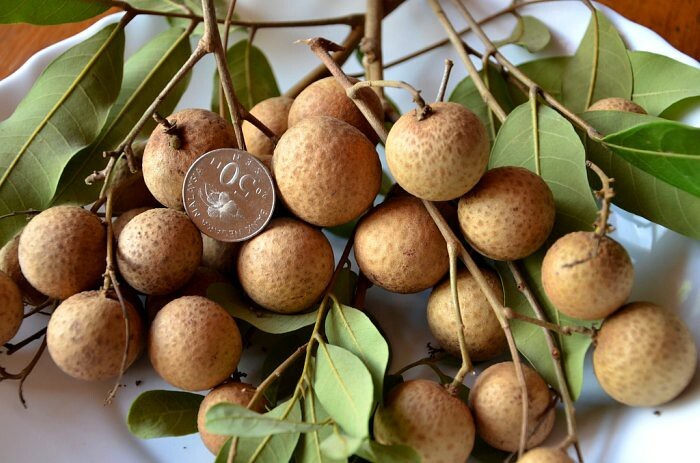 In Cantonese Chinese, the fruit longan ("loong ngan") translates to 'eyes of the dragon' and it's obvious why. Under the translucent flesh of the longan is a hard, shiny black seed that looks like the pupil of the eye. I searched supermarkets and grocery stores but there were no fresh longans. I could stuff black grass jelly into canned longans for the eyeballs but I really wanted some eyeballs with fresh longans. My longan tree has been very leafy this year, bearing very few longans. Where can I get fresh dragon's eyes? Last year when running with my daughter in a nearby housing estate, we passed a house that had very sweet longans over the fence. Would there be any longans on the tree now? I drove to the house, pressed the bell and asked the lady if she could just help me find a handful of longans on her tree. She let me in. I was surprised that she did. I think we both were acting out of character. I don't normally ring doorbells and ask for fruits. Was I lucky because there were little bunches of longans here and there. J is from England, doesn't eat the fruits and welcomed me to take as much longans as I wanted. I offered to pay her, but she waved me off, saying that that's her little contribution to the Breast Cancer Welfare Association. I insisted, so she said that I should visit Sally's Bar in KK Times Square one night. Fresh longans are translucent and so they didn't show up too well in the jelly. 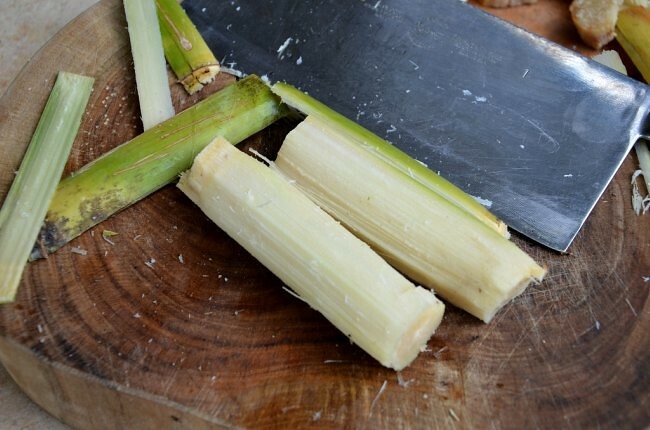 I also used the juice from the sugar cane stems that my mom had dragged home one morning last week. 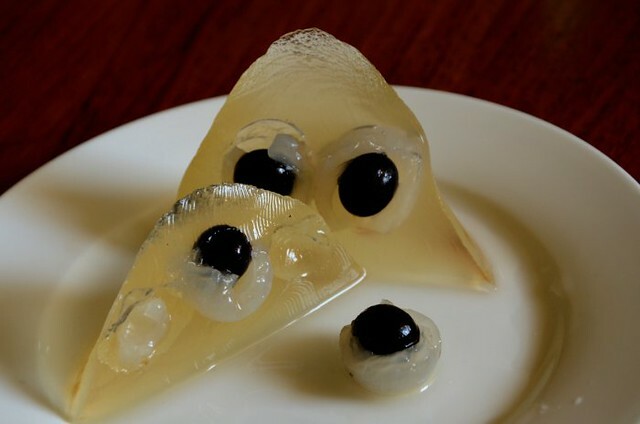 If you were to make this jelly, I think that you'll get better results using canned longans for the eyes and longan juice for the jelly. Whatever, this is my wacky jelly for the week for the Jelliriffic! Challenge. I haven't had sugar cane juice in a long time and it was just so good. I've done 21 jellies and things with the beautiful Nick Munro mould so far. Are you not convinced yet that you should get one mould and make some of those jellies? Remember, your money goes to help women with breast cancer. These longans, some bigger than a 50 sen coin, were some of the biggest longans I've seen and they were very sweet, flavorful and juicy. 1. Peel the fresh longans and remove half the flesh, exposing the black seed. 2. Put 100 ml of the juice into a small pot and scatter the konyakku powder over it. Wait 2 minutes for it to swell and soften. 3. Heat and stir until the konyakku powder is all dissolved. Take off the heat and add the remaining 100 ml juice. 4. 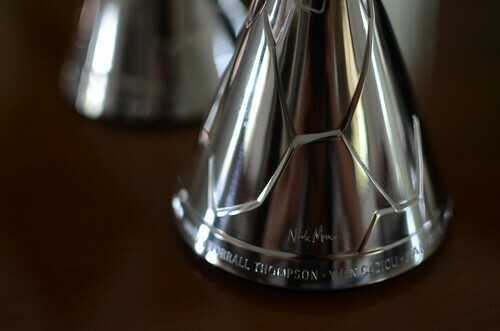 Rinse a Nick Munro mould. Pour about 2 spoonfuls of the liquid jelly into the lould, drop in one or two longans and put the mould into the freezer to set the jelly quickly. 5. Repeat pouring the liquid jelly into the mould and dropping the longans (pupils facing out) into the jelly. You may have to re-heat the jelly in the pot if it sets. 6. 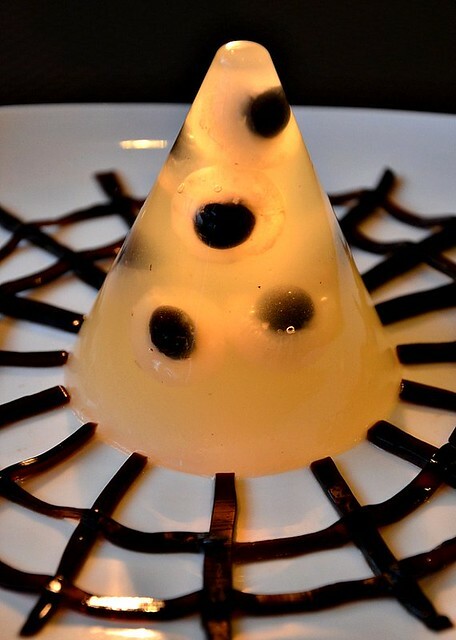 Cut thin strips from the grass jelly and arrange into a spider web on a plate. Place a Nick Munro mould over the center of the web, press down hard to cut the hole for the jelly to sit into. Place the jelly on the center of the web. Definitely to be included for an Asian food theme Halloween! Looks great! wow, mata kuching! my favourite. i can eat one big bunch of these as my main meal!! ;) great theme and presentation. love these with konyaku, perfect match. Terri, this is a chinese halloween theme. Fresh sugar cane and longan. Going to your house now!. The last photo hit the nail, it gave me the creeps! You - deserve to win this! Beautiful creations captured so well on camera! Keep going, Terri! We're with you! This is so interesting looking! So this is the idea we were talking about. Looks like a mad scientist just dug out some ppl's eyeballs n make them science samples...haha... But still look tasty! I must try this. Love that u always use those fresh natural ingredients!Nee. Watched Chef Michael Smith not too long ago preparing some goodies for his son's trick or treat party. And he used eye balls in a drink. this is cute and cool.. I am spooked all right, Terri! Never knew longans can be so scary, lol! Your comparison of Western and Asian ghosts made me laugh so much - so true. Western ones are so funny and even pathetic but an Asian one,(think Japanese/Korean)....(lets out shrieking scream!!!!!!!!) Hats off to you, your creativity knows no bounds. I would like to read more about ! !I will have the best costume to the next Halloween .. thanks for sharing my friend !